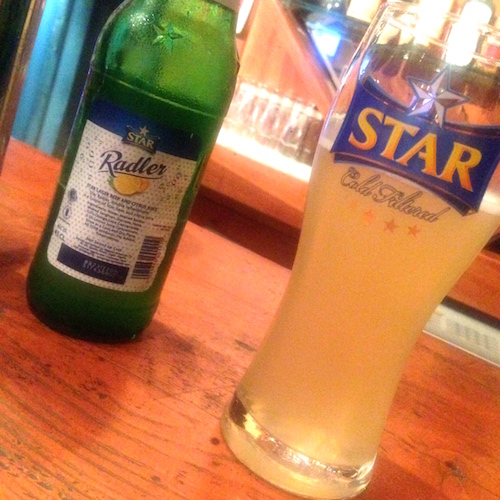 NOSA: Finding Star Radler in a Lagos bar is like searching for BigFoot. We went to like 3 or 4 bars before we finally found it. It's a full on adventure. No way this is by design. Can't be. FOLLY: I wonder why this is. Perhaps most bar owners aren't yet convinced on the drink, and so they don't want to stock too much. In fact, when we finally found it at Pat's Bar, they only had 5 in their fridge. We bought two and then some other ladies came in and bought two, we had to hustle to reserve the last one for our friends that were joining us later. NOSA: Maybe I should start selling Star Radler on the black market or in a speakeasy and be the Nucky Thompson of Lagos. FOLLY: If you go into any major supermarket (like Shoprite, Spar, Ebaeno), you can find it there by the truck load. NOSA: For some reason, I thought it would taste like Blue Moon. The taste reminded me of the special Star + Sprite mix I used to make at NYSC camp. Like, the same ratios and everything. Clearly someone stole my idea. Star Radler is more fizzy drink than beer to be honest. FOLLY: I feel that's what the beer drinker would say about Star Radler. However, if you're not a regular beer drinker like myself as far as you're concerned this will be beer as you know it and you'd probably like it. NOSA: Yeah, if you're a regular beer drinker, this might not do it for you. It's a little, umm, light on the alcohol compared to the average beer, but that's the trade off. If you want a beer but don't want the pain and suffering that's the crux of a regular beer, this is the one for you. FOLLY: The drink itself is a very pale yellow and has less foam than regular beer when it's poured. Is there any beer connoisseur that knows why that is the case. Is it because of the mix of orange juice and the lager? NOSA: Might be a connection. Most blonde lagers tend to be fruity, see Blue Moon. FOLLY: That said, I was a HUGE fan. If the bar didn't run out of Radler I probably would have had at least two more, no lie. NOSA: That's something the bars or Star themselves need to fix. FOLLY: A couple of our friends were supposed to join us for this taste test, but didn't make it. I tried to lure them on the premise of free beer on EDL - but somehow that wasn't appetizing enough. Awks for them, cause they'd have gotten free dinner too but they'd have had to come to find that out. My cousin, "Lanzz" (lol, yes) , did join us on our little adventure. LANZZ: It's nice. Very nice. LANZZ: Just enough beer, just enough citrus and it goes down really well.